The DataKeeper Notification Icon is an application that will show a summary of your DataKeeper mirrors in the Windows Notification Tray. The icon displayed indicates what conditions have been detected, with the following priority. Error: An error condition, such as split brain (requiring manual intervention), has been detected. Warning: This indicates that there is a condition that may require administrative intervention, such as a mirror being paused or broken, or a transient split-brain condition. Resync: This indicates that a mirror is in the resync or resync pending state. Mirroring: This indicates that all mirrors are in the mirroring state. Disabled: This indicates that status updates are no longer occurring. During this state none of the other status conditions will be displayed. More details about these conditions can be found by hovering over the DataKeeper Notification Icon, such as how many mirrors are in each state, or the nature of the detected error condition. Some examples are shown below. Note: The DataKeeper Notification Icon uses DataKeeper jobs to determine which remote systems to poll for information. Only the status of mirrors in jobs that contain the node on which the DataKeeper Notification Icon is running will be reported. In addition to the display functions, the DataKeeper Notification Icon also serves as a shortcut to managing your DataKeeper mirrors. Double clicking on the DataKeeper Notification Icon will launch the DataKeeper GUI. Launch DataKeeper GUI – Launches the DataKeeper GUI. Launch License Manager – Launches the SIOS License Manager. Launch Health Check – Opens a command prompt and runs DKHealthCheck. Gather Support Logs – Runs DKSupport and opens an explorer window to the location containing the new archive. Set Refresh Rate – Will allow you to set how often the icon refreshes its state information. 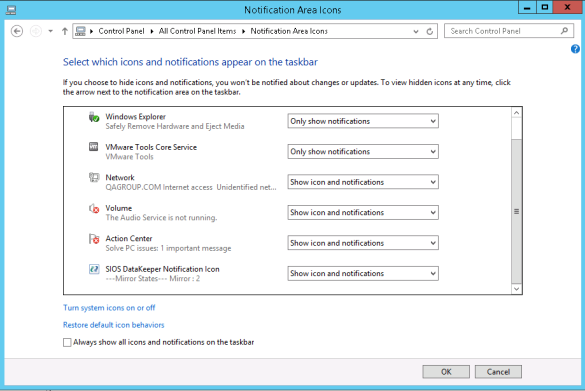 Disable/Enable Status Updates – Disables and Enables Status Updates. Requires EmTray to be run with administrator permissions. Exit – Stops and closes the DataKeeper Notification Icon. The Notification Icon should automatically appear in the Windows Notification Tray upon logging in to the node. To re-enable this functionality, simply create a shortcut from the EmTray.exe (located at \DKTools) to the same location above.